3-2-1, blast off! 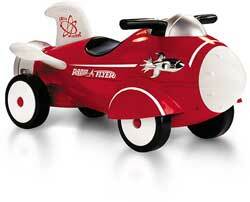 The Radio Flyer Retro Rocket features vibrating motor action so it really feels like you're taking off. Working lights and realistic astronaut/space sounds add to the fun. The rolling wheels activate the lights and sounds, and there's also a light-up after-burner, a clicking nose cone, and cool retro styling. Under-the-seat storage allows budding astronauts to pack a few essentials. Plastic. Clean with soap and water. Some assembly required. Made in USA. 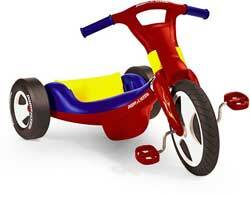 For ages 2 to 7 yrs.